As a medical practitioner, your ultimate goal of having a website is to provide patients the information to learn more about your practice and services. Hopefully, those informed patients will make an appointment or contact your practice, resulting in a consultation. According to Pew Internet, almost 72 percent of Americans search online for health-related information. This means that the first point of online contact, the physician’s website, must be optimized to convert visitors into new patients. An optimized website helps increase patients’ trust in you and your services, attracts visitors to provide contact information for mailing lists and enhances the ROI of your online marketing efforts. No matter how many people visit your website, if it is unable to attract new patients or if your website conversion rate is less than 5 percent, it is time to optimize your medical practice website. After all, according to an industry report, increasing conversion rates by just 1 percent can reduce your media costs by almost 33 percent. While it is critical to increasing traffic to your website, that traffic may not be helpful if it is not resulting in appointments. So, in addition to trying to increase the amount of traffic to your website, you should focus on making your website more effective and user-friendly so that most of your website visitors get converted to new patients. Begin with the end in mindIn other words, what is the goal of your website? Fuzzy phrases such as, “We want to provide information to patients,” will most likely lead to failure and frustration. WHY? Because you failed to define the ultimate goal and purpose of your website. What goals are you trying to achieve? While patient education and satisfaction are high goals to ponder, they are difficult to measure. Through Google Analytics and other online analytic tools, you can measure and track your website’s performance, which is usually discussed regarding metrics. Your basic site metrics should include the number of unique visitors, the total number of visitors, page visits, the amount of time spent on the website, bounce rate and conversion rate. Here, the conversion rate is the ultimate metric because it measures the number of email inquiries or phone calls received by the practice directly from the website. For instance, if you get 100 unique visitors in a month, with ten email inquiries or phone calls to the practice, your website converts visitors into new patients at a rate of 10 percent. This is a good conversion rate. A knowledge of what to measure and how to measure will make you feel motivated as well as help you make the necessary adjustments required to improve the conversion rate. Make your website mobile-responsiveThe data for healthcare customers and the way they are using mobile devices is quite compelling. One of the most impressive statistics is the conversion rate of mobile users. According to studies, 44 percent of patients who searched for medical websites for information went on to make an appointment. This fact points to the importance of an engaging experience for mobile users. In addition, Google’s algorithm penalizes websites that are not mobile-responsive. By having a mobile responsive website, you allow your practice to connect with these highly engaged healthcare consumers. Instead of building separate websites for desktop and mobile users, Google suggests healthcare marketers build one website that can scale up and down to fit the different screen sizes, thus making it responsive. This means your practice website will automatically change the dimensions to fit the screen of the device being used to search. According to Google’s study, nearly 65 percent of searches began on a mobile device. The inability of your website to automatically adjust to devices will create a negative user experience and may result in significant revenue loss for the practice. How to check if your website is mobile responsive? You can test the mobile responsive functionality of your website in a few seconds. Open your website in a browser, and using the mouse, grab the right side of your browser window all the way to the left until you cannot shrink it anymore. How does your website look? Does it look proper or is it cut off on one side? If your website is cut off, content is not readable, or your website looks distorted. This is an indication your website is not mobile-responsive. With technology constantly evolving, it is suggested to check up on your responsive design at least biannually. This will give you an opportunity to identify any potential issues with your website and make necessary updates. Do not compromise on contentThe first step toward establishing a patient-converting website is attracting relevant visitors. To do this, you need to follow two fundamental rules: Create content that your target audience is seeking and promote that content consistently. These rules work best together. You cannot follow one without the other. This is because creating great content may attract target audience to your website, but without consistency, your audience will lose interest. Similarly, quantity is not an alternate for quality. Stuffing your website with run-of-the-mill content may help you attract a few visitors, but they will quickly spot a lack of substance in the content, and your practice reputation will suffer as a result. What makes good online content? Good content is what your target audience wants to consume. When you search Google for anything from flu to insomnia, Google uses its index of keywords related to your search and returns websites that fit your query. The fundamental principle here is that the more frequently a keyword appears on a website, the higher that website will rank in relevant search engine results. For your website content to be useful, it must be engaging. Engaging content may include images, graphics and catchy headlines. The most important function of a website is to convert leads to new, paying patients. To achieve this, it is important to serve potential patients the information they are looking for. In addition to other forms of content, these new patients are looking for clear and easy guidelines to connect with your practice. When potential patients want to make an appointment, they do not want to search every page of your website trying to figure out the process to schedule a visit. In all likelihood, if they cannot find that information easily, they will just give up. To handle such situations, put your phone number on both the header and footer of each page. Search engine optimization (SEO) – the most important strategyThere are hundreds of books and blogs written about SEO, and there is no way to do justice to the benefits it offers in a few paragraphs. To summarize the objective and benefits of SEO: If you are looking to attract, serve and retain patients, then SEO is one of the most important strategies for your medical practice. On-page SEO: This refers to everything within your website and includes indexable content, crawlable links and URL structures, and optimized pages, meta-descriptions and title tags. Off-page SEO: This refers to external SEO opportunities and includes various ways to attract attention to your website through link building, sharing content and optimizing for mobile search. A clear, simple and user-friendly website is the way to go:Generally speaking, the best websites are those that are easy to navigate, informative and appear to be credible. Conversely, visitors tend to avoid sites that are confusing, require too much time and seem unreliable. 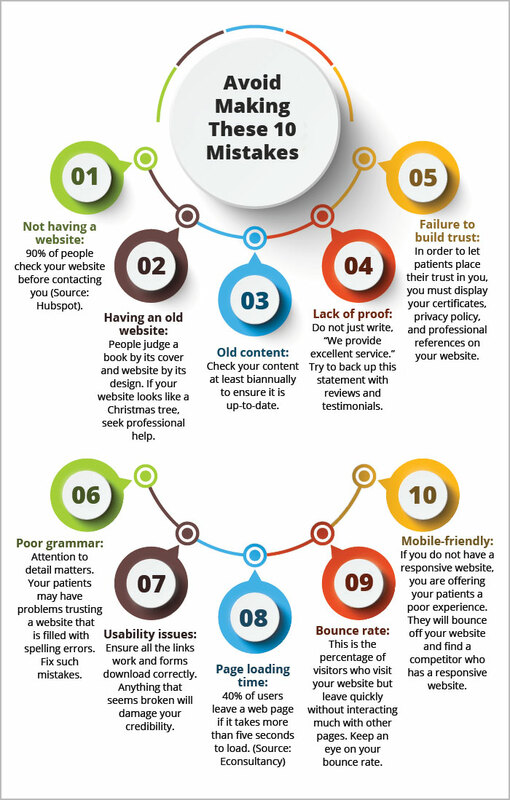 Luckily, there are easy ways to ensure your website falls into the former category, not the latter. Be sure your website is scannable. This is because visitors rarely read the text closely. To make reading a breeze, make the headlines’ font larger, and break the smaller text into digestible pieces. Headlines should also contain search-specific keywords, which will enable visitors to find what they were looking for, and improve your search engine ranking. Successful websites also feature images that lend a human face to the practice. You can post pictures of your staff and virtually welcome patients into your office. According to research from KissMetrics, adding images to a webpage can increase conversion rates by 95 percent. Video content can provide a significant boost, as well. According to Animoto, nearly 73 percent of U.S. adults are willing to make purchasing decisions after watching an online video. Look at it this way: Unless the online experience exceeds the office experience, the visitors will continue their Google search to the next medical practice. You must remember website development is a dynamic process. While certain rules remain constant, the technology and user behavior are always evolving. Effective website design must include the ability to measure what’s working and what needs improvement. Having a website is critical to being successful in the healthcare community. However, a brochure site will never take you places. As a medical practitioner, it is your duty to empower your patients and to be thought leaders in your industry. An investment in your website design and content will pay dividends in the form of new patients and improved online visibility. You will experience increased traffic, better conversion rates and increased revenue. For most healthcare providers, it all starts with belief. If you believe that with the right focus, technology and expert guidance, you can attract more patients to your medical practice, then we can show you how. Schedule an appointment today, and experts will help you design a new website or upgrade your existing one. We can help you increase traffic, attract new patients and grow revenue. At Practice Builders, we look forward to serving your practice.